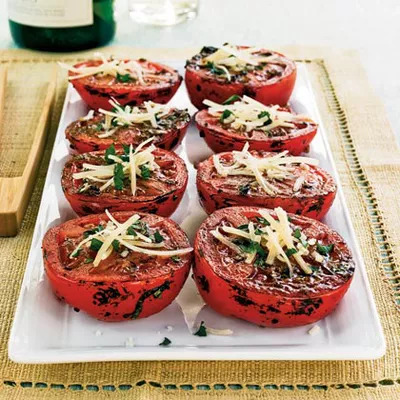 Tomatoes are a great snack or side dish. They're low-cal (only 60 calories!) and high in nutrients like vitamins A, C, and K. Grill them on the barbecue, a panini press, or right in your oven. This dish take about 20 minutes to make, but you can make a few at once and leave them in your fridge for healthy snacking all week. Ingredients: extra-virgin olive oil, balsamic vinegar, garlic clove, fresh basil, salt, pepper, tomatoes, Parmesan cheese, fresh parsley.